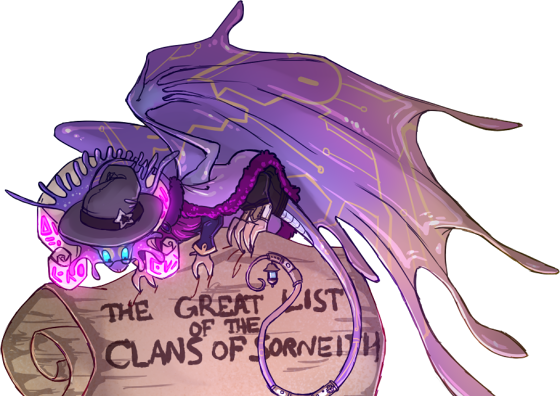 Welcome to the new clan directory, The Great List of the Clans of Sornieth! This listing is just for fun; you do not have to add your clan to it to be recognized as an official clan or anything like that. It is just meant to give a quick way for people to see who else their clan shares the world with. To add your clan to the list, you will have to fill out a quick survey, asking for your flight, username, clan name, and a quick blurb about your clan. If you don't have a clan name, feel free to write N/A or just Name's Clan. Similarly, if you can't think of anything to write about your clan, N/A or something simple such as 'Here be dragons' will suffice. If you're interested in going into more detail about your clan, why not check out the Lore Library, a database for lore clans. Now with some quick stats! Come join the Friend Rising Discord server! doop. Added the stormwatch clan, my bunch of destructive fools. there's some weird stretching going on. any way you can make it wrap a little better? Should be better now. I'll leave it on wrap for a while, but if the text boxes end up really tall I'll have it cut off so that you have to click them to see their full contents. Added my babies, the Clan of the Deepest Dreaming. Maybe this will be the impetus I need to finally write their lore down. "We are the music-makers, and we are the dreamers of dreams. World-losers and world-forsakers, on whom the pale moon gleams. For we are the movers and shakers of this world forever, it seems." @ZincAlloy , whoops! My connection went weird for a moment so please remove my duplicate entry in Lightning off the index. Added mine! I put it under Nature - I know I'm currently in Wind, but it's just a vacation and will be moving back to Nature in two months (and the clan is still Nature at heart, even in other regions).